Generate random passwords anytime you need it! It's Free! 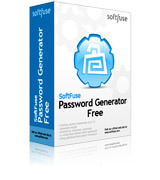 SoftFuse Password Generator Free has few advanced features: generating passwords by mask, MD5-hashes, using prefixes and suffixes, exporting passwords to the files (txt, rtf, xml, html). SoftFuse Password Generator Free can be also easily used for generating random user IDs, PIN-codes, random lottery numbers, etc. Take a look at our standard password generator or professional password generator.